Before I had this blog, I had a little craft blog. I haven’t kept up on that craft blog but I wanted to move some of my favorite posts over here and share some of our new favorites. 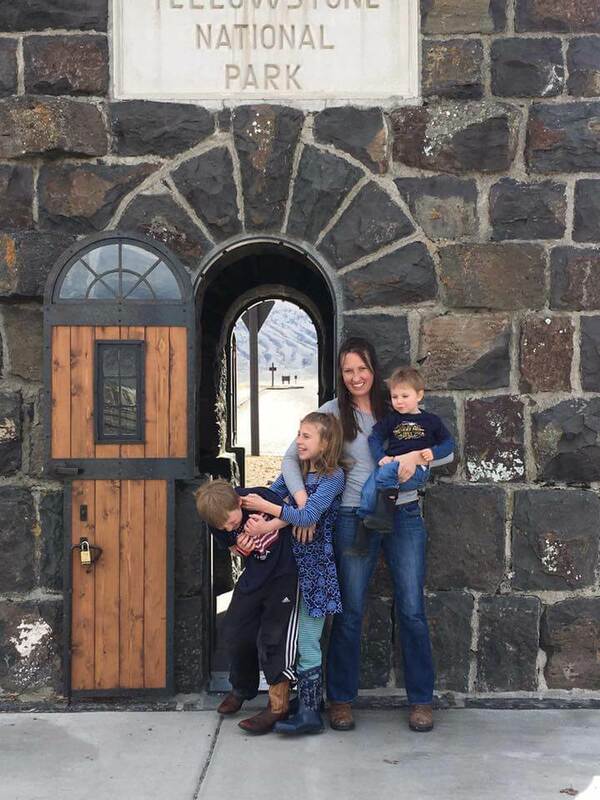 Healthy living easily extends to the activities we do with our children and what they play with. 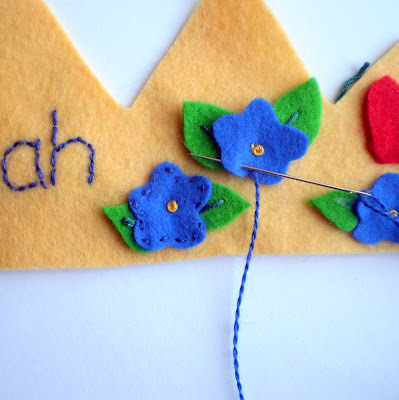 These crafts are fun to do with our older children and do for the younger ones. Hannah turns 3 this month! (this post is 3 years old, she turned six! And we still have the crown). I made her a crown, since she loves that sort of thing. I love seeing her little personality develop. 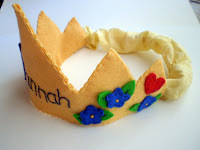 She’ll love wearing her birthday crown for her special day, so she needed a crown this year! I took pictures as I made it, to share. 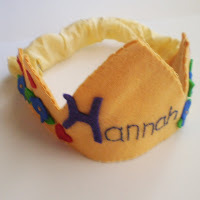 I find it really rewarding to turn some scraps of fabric into something special for my little one. 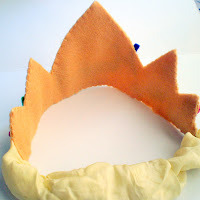 To get the shape, try tracing a crown shape onto a paper bag or construction paper, and then holding it up to your child’s head. The elastic in the back will allow it to work for all ages. Stitching on the flowers. 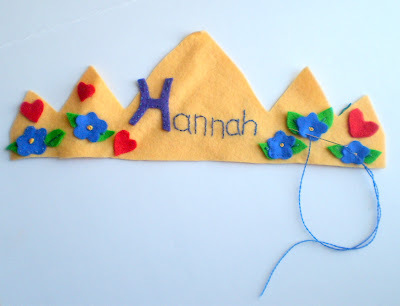 This is wool felt (see here), I promise if you’re investing the time to hand make something like this you will want to use wool felt rather than the slippery pilly polyester sold in craft stores. The blue thread is laceweight yarn from Knitpicks, it’s alpaca and silk. I also used plain cotton embroidery floss. Added elastic so it lasts through the years. Encased in silk to make it more festive, and securely attach between the layers of felt. 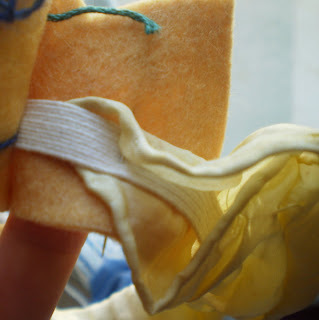 This is silk that we dyed with cake dye to be a pretty yellow. It’s slippery to sew, but since it’s bunched with the elastic it still looks great even if your stitches aren’t perfect. 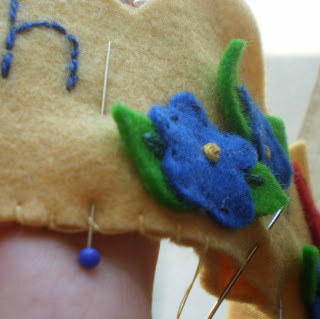 Pinning the two layers together, closing with a blanket stitch all around.